By Scott Gilfoid: After dazzling last night with a superb 4th round knockout win over Nick Brinson (16-3-2, 6 KOs) at the beautiful Beau Rivage Resort and Casino in Biloxi, Mississippi, #9 WBC super middleweight contender Andre Dirrell (23-1, 16 KOs) will be back in the boxing ring in two months against a still to be determined opponent in December. 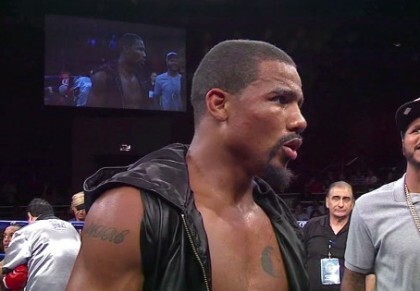 Dirrell wants to keep moving forward to get a world title shot against one of the champions, although he completely ruled out any chances of him fighting his brother WBC 168lb champion Anthony Dirrell. The WBC has Dirrell ranked #9 by their organization, but there’s no way he’s going to fight Anthony. “I’m looking for a fight in December. I just want to focus on being sharp, because these are the fights that are going to line me up for that big fight. I’m looking for the big fights, and I know it’s coming,” Dirrell said after dispatching Brinson last night. Dirrell caught Brinson with a left hand to the head in the 4th round that badly stunned Brinson. At the time that Dirrell caught him, Brinson was trying to throw a wide left hook, but Dirrell’s straight left hand got there first, causing Brinson’s head to whiplash violently. Dirrell then moved in and finished Brinson off with a series of hard power shots to the head and body. The referee Keith Hughes stopped the fight at 2:12. He could have let the fight go on a little while longer, but it’s pretty clear that Brinson would have been on the canvas in the next 20 seconds with the way that Dirrell was pummeling him with blinding fast punches. Brinson was trying to cover up, but the shots were coming in too quickly for him to block everything. As for who Dirrell will be fighting in December, it’s anyone’s guess, but you can assume that his adviser/manager Al Haymon will find a quality opponent for him to fight. Dirrell needs someone that can get him pushed up the rankings quickly. I’d personally like to see him fight someone like Gilberto Ramirez, George Groves, Sakio Bika or Callum Smith. Obviously, the chances of Dirrell getting any of those fighters to agree to face him or slim and none. They’re probably not going to take a fight against him due to the danger he presents.